When it comes to participating inside a classroom setting, most young adults and kids are led to believe that the teacher is correct 100% of the time. While teachers are hide as professionals who have undergone an extensive degree of schooling, students and others must not forget that they are humans that also make mistakes and can be wrong themselves. 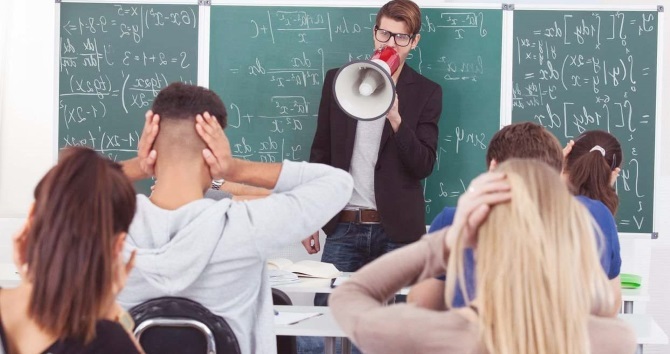 While teachers at times might seem like a powerful authoritative figure, there are many reasons as to why students should be less reluctant to confront teachers in discussion. Confronting teachers on their mistakes, or questioning things being taught in the classroom, for example, promote healthy and professional discussion. Teachers are hired to be professionals in the work that they do, and since it is their job, it can be assumed that they will not overstep their boundaries with their students but instead engage in discussion of the topic at hand so the student can more accurately grasp anything that is misunderstood. Some teachers may be focused on other things and could possibly ignore a student and have their troubles go unnoticed. Defiance from students may indicate a more serious situation is at hand regarding their environment. A certain level of defiance from the student body or particular students may lead to further investigation of school situations or other social issues that could be uncovered and dealt with. This, in terms of sociology, is a perfect example of one of the intrinsic functions of deviance as listed by Durkheim, which is the promotion of social change which comes about through (typically) the defiance of authoritative figures. In fact, these functions of deviance as stated by Durkheim support the idea of early deviant behavior serving within multiple positive purposes. An early display of defiance from students helps clarify social norms to them at an early age. The instance of defiance within a school setting, in this case, helps them safely realize the attitude that may be necessary or expected of them when in this specific social setting in front of an authoritative figure such as a teacher. Another instance of the possible positive benefits of defiance from students stems from another argument made by Durkheim: it promotes the unification of groups. Certain forms of defiance may create a stronger bond among certain kids within the student population, whether they are among the more popular side of the student body or not. For instance, a teacher who seems to grade unfairly when it comes to specific students’ submitted homework may be called out on it by a seemingly “defiant” student, only to have more students come forward with the same issue. This is just one of the many examples of how this aspect of defiance actually becomes a positive interaction and can help build a student’s ability to speak out later on in life. Another one of the four functions of deviance that is suggested is that deviance helps define our moral values and beliefs. A very deviant student at a young age may come to realize the dynamic that is supposed to occur between them and the teacher. This is considered by most to be an extremely necessary realization to come to, especially before an adult age where further unwarranted deviance could incur more serious negative consequences. Not only is deviance natural before an adult age, it is essentially expected, and prepared for. Defiance of teachers can not only reveal problems a child may be facing but help them develop important social skills that will later become a necessary vehicle for communication later in life. When it comes to defiance in regards to more serious issues, even in school settings, it could lead to major changes, and this goes to show that speaking out and the opinions of those of not authoritative status actually matter. Defiance from students at a younger age range promotes personal growth and helps to define the meaningfulness of unity between themselves and people of the same status. Calling out and defying teachers from an academical standpoint will also cause the propagation of intellectual conversation as a whole, and when done to a respectable degree with the right intentions can be the starting point for change or a better understanding and representation of many important subject matters.